Gaming laptops used to be looked at with derision due to their higher price point than desktops and their lack of customization, but times are changing. Gaming laptops are getting cheaper and cheaper, and you can’t ignore their improved convenience. Today, we’ll be reviewing one of ASUS’s top models. The first thing you’ll notice about this gaming laptop is the price, which is much cheaper than you would expect for a machine with these specs. Thankfully, everything that you see advertised comes with the computer, and its gaming performance is about as good as you would expect. For example, the i7 processor gives you all of the power that you’ll need to game without hiccups, and it works well in tandem with the GTX 1050 graphics card. While the 1050 may not be Nvidia’s most powerful graphics card, it is still more than capable with today’s games. While you may see some stuttering if you decide to turn up the graphics, you can get a reasonable enough compromise between frame rate and quality with this card. When it comes to the storage options, you have access to both a 128GB SSD for your Windows installation and a standard hard drive for storage space. Now that we’ve covered the specs of this model let’s move on to the laptop itself and its external build quality. First off, the 15.6″ matte display may sacrifice color quality compared to a glossy panel, but it makes up for it when it comes to glare resistance. You’ll find that the keyboard on this model, as with any other gaming laptop has anti-ghosting implemented so that you can use several keys at the same time. The inclusion of a pair of wifi antennas also means that you won’t have to be consistently hooked up to ethernet. When it comes to issues, this laptop tends to suffer from poor build quality thanks to the plastic case. As always with gaming laptops, the more prudent decision would be to opt for a model with a metal case for the improved resilience that it will offer. 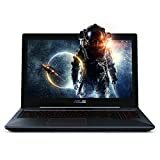 If you’re looking for an affordable gaming laptop and you want to opt for a trusted manufacturer, then this model from ASUS will probably work best for you. While this laptop may not be as impressive as some of the top-range models on the market, it can get the job done. Thank you for your time, and we hope that this review has helped you.